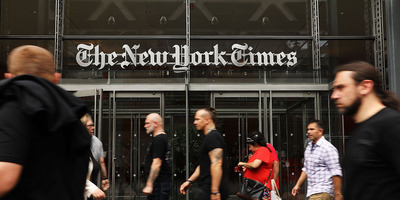 Spencer Platt/Getty ImagesThe New York Times headquarters. A new report found that major American news outlets have more politically polarised audiences than their counterparts in any other country. 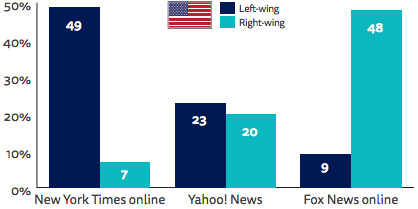 Notably, liberal audiences consume news from a wide variety of outlets, while just one outlet – Fox News – captures the vast majority of conservative news consumers. And right-leaning Americans are twice as likely to mistrust the news than those on the left, the report found. As the news media face intensifying accusations of “fake news” and American trust in media sits at just 38%, left-leaning and right-leaning audiences continue to gather their news from different sources. On the left, audiences are shared among a wide variety of the most popular news outlets, including The New York Times and CNN, but on the right, Fox News dominates, according to a new report from the Reuters Institute for the Study of Journalism. Right-leaning Americans are twice as likely to say they mistrust the news than those on the left, the report found. And, overall, just 38% of Americans say they trust the news media in general (53% say they trust the news they consume). Reuters also found that American audiences are the most politically polarised in the world.